This post is by Eli Shepherd, a program leader with the Iowa City, Iowa program. This summer, the Iowa City Summer of Solutions (ICSoS) Our Power project hosted two public forums on rental energy efficiency issues. With all stakeholders working collaboratively- tenants, landlords, utilities, city officials, and community members- we developed a comprehensive list of barriers to energy efficiency for both tenants and landlords, as well as possible solutions. We then, with the help of a local energy efficiency consultant, developed a comprehensive recommendation to Iowa City City Council based on the most feasible solutions. Kira Stoller of the ICSoS Our Power team then prepared and presented our recommendation to council during the community comment period at the most recent council meeting and we will continue to communicate with the city in order to, with any luck, implement much if not all of our recommendations. Without further ado, here is what we came to council with, hope you like it! Part of the Iowa City Our Power team following the first public forum. By Kate Johnson of the Iowa City, Iowa program. This summer must have big plans for something fun in the fall, because it sure is in a hurry to get there! 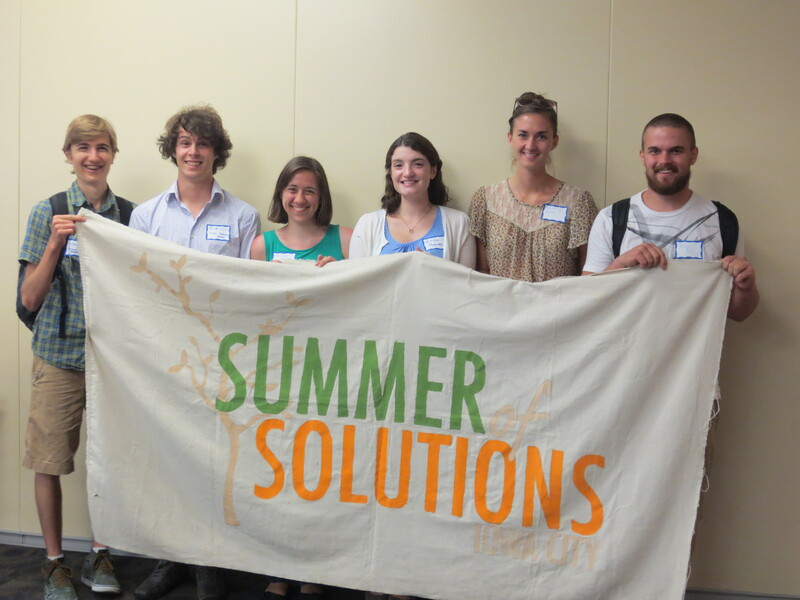 It has been a whirlwind of a few months here at Summer of Solutions in Iowa City, and we’ve been making the most of it in the ‘Sustainable Art’ group under the direction of Nick Gerken. Though we have been sparsely populated, we’ve had some great assistance from our friends in ‘Our Power’ and ‘Iowa City Roots’. With whoever we could grab, we have traveled to camps all summer, working on crafts with kids and talking to them about the environment. After a week long orientation with our group leaders Nick Gerken, Eli Shepherd, and Kate Anstreicher, we split up into subgroups run by each leader geared toward specific causes. Eli is in charge of ‘Our Power,’ which is an energy sustainability initiative with an end goal of addressing the split incentive issue for city counsel in regards to rental properties in Iowa City. Kate leads ‘Iowa City Roots,’ which is a community gardening force working with the Iowa City landfill to implement a composting collection service for downtown businesses. Then there is ‘Sustainable Art,’ the program that I am in. Nick heads this subgroup and our weekly activities for a range of summer camps with the goal of educating about waste and waste management through hands on activities and recycled artwork. Our group of about four people just recently came up with an idea we are very excited about: downtown window painting. The end of fall marked the rekindling of planning and organization. Winter came and plans were made, the leadership team organized. January rolled around and said team journeyed to Chicago for several days of intensive and enlightening training. Spring brought both metaphorical April showers and May flowers as plans and programs were dreamed up, debated, shot down, and solidified. Participant applications and grants alike came sporadically. Now it all comes down to summer. Summer is back already!..wait, it’s not? Well, with sixty degree weather in November and December it sure feels like it. The physical season of summer may not be here but the problem-solving and action-oriented spirit of summer which earns us the name “solutionary” is most certainly in full swing. Iowa City solutionaries hard at work at Wildwoods Farm in Solon, Iowa.